ST. LUDGER was born in Friesland about the year 743. His father, a nobleman of the first rank, at the child's own request, committed him very young to the care of St. Gregory, the disciple of St. Boniface, and his successors in the government of the see of Utrecht. Gregory educated him in his monastery and gave him the clerical tonsure. Ludger, desirous of further improvement, passed over into England, and spent four years and a half under Alcuin, who was rector of a famous school at York. In 773 he returned home, and St. Gregory dying in 776, his successor, Alberic, compelled our Saint to receive the holy order of priesthood, and employed him for several years in preaching the Word of God in Friesland, where he converted great numbers, founded several monasteries, and built many churches. The pagan Saxons ravaging the country, Ludger travelled to Rome to consult Pope Adrian II, what course to take, and what he thought God required of him. He then retired for three years and a half to Monte Casino, where he wore the habit of the Order and conformed to the practice of the rule during his stay, but made no religious vows. In 787, Charlemagne overcame the Saxons and conquered Friesland and the coast of the Germanic Ocean as far as Denmark. Ludger, hearing this, returned into East Friesland, where he converted the Saxons to the Faith, as he also did the province of Westphalia. He founded the monastery of Werden, twenty-nine miles from Cologne. In 802, Hildebald, Archbishop of Cologne, not regarding his strenuous resistance, ordained him Bishop of Munster. He joined in his diocese five cantons of Friesland which he had converted, and also founded the monastery of Helmstad in the duchy of Brunswick. Being accused to the Emperor Charlemagne of wasting his income and neglecting the embellishment of churches, this prince ordered him to appear at court. The morning after his arrival the emperor's chamberlain brought him word that his attendance was required. The Saint, being then at his prayers, told the officer that he would follow him as soon as he had finished them. He was sent for three several times before he was ready, which the courtiers represented as a contempt of his Majesty, and the emperor, with some emotion, asked him why he had made him wait so long, though he had sent for him so often. The bishop answered that though he had the most profound respect for his Majesty, yet God was infinitely above him; that whilst we are occupied with Him, it is our duty to forget everything else. This answer made such an impression on the emperor that he dismissed him with honor and disgraced his accusers. 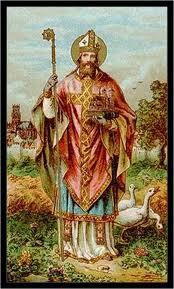 St. Ludger was favored with the gifts of miracles and prophecy. His last sickness, though violent, did not hinder him from continuing his functions to the very last day of his life, which was Passion Sunday, on which day he preached very early in the morning, said Mass towards nine, and preached again before night, foretelling to those that were about him that he should die the following night, and fixing upon - place in his monastery of Werden where he chose to be interred. He died accordingly on the 26th of March, at midnight. Reflection.—Prayer is an action so sublime and supernatural that the Church in her Canonical Hours teaches us to begin it by a fervent petition of grace to perform it well. What an insolence and mockery is it to join with this petition an open disrespect and a neglect of all necessary precautions against distractions! We ought never to appear before God, to tender Him our homages or supplications, without trembling, and without being deaf to all creatures and shutting all our senses to every object that can distract our minds from God.